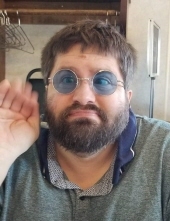 Michael T. Smart, 49, Marshfield, passed away on Wednesday, March 27, 2019 at his home surrounded by family. Michael was born on March 14, 1970 in Wisconsin Rapids. He was a 1988 graduate of Lincoln High School, Wisconsin Rapids. As a young man he was employed at County Market in Wisconsin Rapids. He later worked at Ore Ida Foods which later became McCain Foods in Plover. Mike was a living miracle. Despite health issues at the age of 10 and not expected to live much longer he managed to survive with faith, positive thinking, stubbornness and a sense of humor. He is survived by the love of his life, Lisa Rupnick who made the last 5 years the happiest of his life. He is also survived by his daughter, Kara (fiance’ – Dakota Mateer) Bauknecht. He is further survived by his parents, Beverly and James Hawke, his grandmother, Katherine Grimm and siblings, Ronnie (Debbie) Smart, twin sisters, Sandy (Ed) Ganoe and Cindy (Jon) Dahlman, twin brothers, Ed (Sandy) Smart and Fred Smart, and James (Tonya) Hawke and several nieces and nephews and great nieces and nephews. He was preceded in death by his grandfather Grimm. "Email Address" would like to share the life celebration of Michael T. Smart. Click on the "link" to go to share a favorite memory or leave a condolence message for the family.